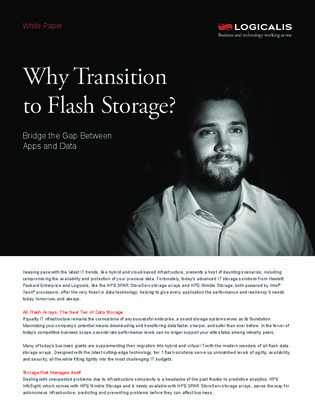 Why Transition to All-flash Storage? Application performance issues often arise when servers are faster than traditional disk-based storage – a problem all too common in hybrid- and cloud-based infrastructure. As a result, data-intensive apps like VDI and OLTP need to continually wait for storage systems to deliver more data. This paper breaks down how businesses are supplementing their hybrid and virtual environments with all-flash storage to achieve the desired levels of agility, availability, and security that these workloads demand. Additionally, reading on will grant you access to the benefits of self-managing all-flash arrays, which can predict and prevent infrastructure problems before they affect your business.